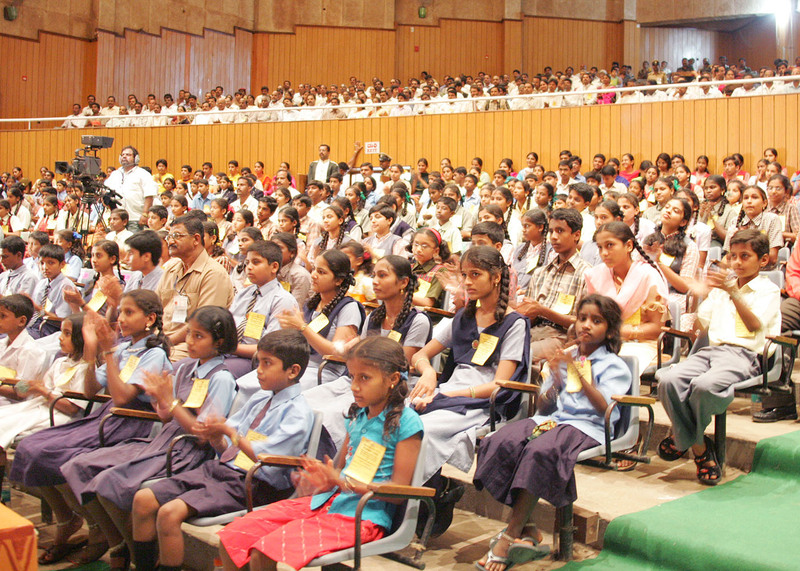 I am delighted to interact with the students from different schools of Hassan. My greetings to the principals, teachers, parents and students participating in this function. I would like to share with you some thoughts on "Values in Life". His Holiness Sree Sree Sivakumara Swamiji of Sree Siddaganga Math of Tumkur is an example of spreading the message of "giving". 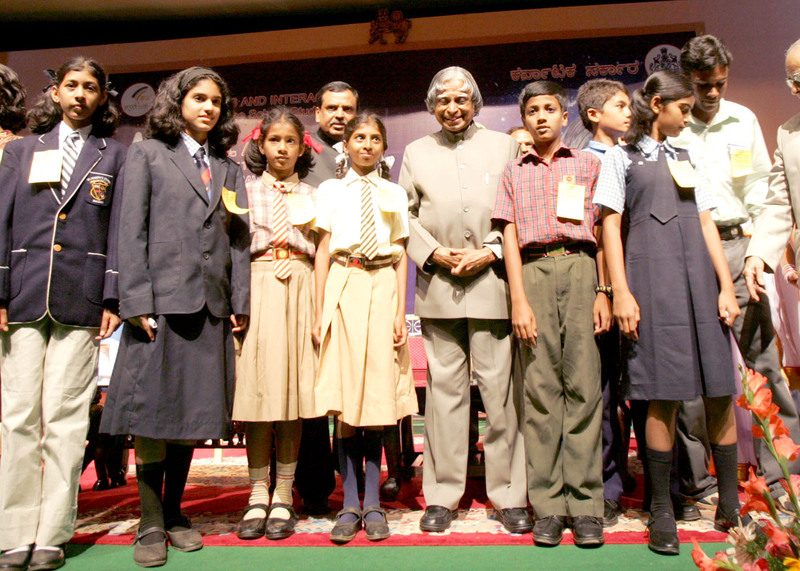 He has been on a tireless mission of socio-economic development and eradication of inequalities in education. He saw education and alleviation of hunger among the masses as an effective means to enrich human capacity which in turn would contribute to national reconstruction. His Holiness Swamiji has followed the footprints of his Guru of providing free boarding home to the students which is now serving the needs of over 8,000 students. In addition 2000 pilgrims and visitors in the Math are also provided food every day. 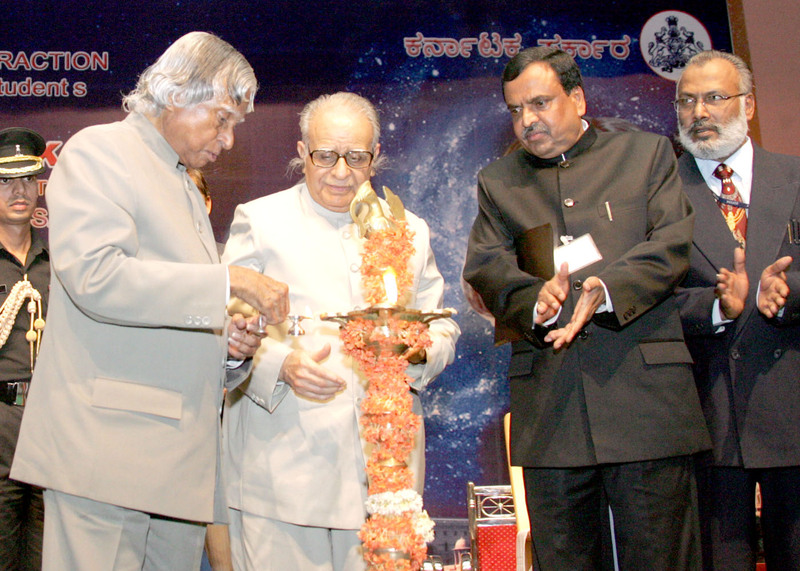 During the last seven decades Swamiji is the founder of well over hundred and twenty five educational institutions ranging from nursery to institutions of technology, pure science, arts, management, vocational training and performing arts. I have come across many incidents where people have, irrespective of their normal professional affiliations, have come forward for great societal missions by giving. Our education system should lay the foundation among the young for evolving a conflict free, happy life resulting in an attitude of "giving" and "giving". Let this tribe of citizens grow and grow. Human flight is nothing but creativity of human mind and it undergoes several struggles to achieve excellence. In 1895, a great well-known scientist Lord Kelvin, who was the President of Royal Society of London said, "any thing heavier than air cannot fly, and cannot be flown." Within a decade, Wright Brothers proved man could fly of course at heavy risk and cost. On the successful completion of Moon Mission in 1969, Von Braun, a very famous rocket designer, who built Saturn-V, to launch the capsule with astronauts and made moon walk a reality, in 1975 said "If I am authorized, I will remove the word impossible". According to the laws of aerodynamics the bumble bee should never be able to fly. Because of the size, weight, and shape of its body in relationship to the total wing span, flying is scientifically impossible. The bumble bee, being ignorant of scientific theory, goes ahead and flies anyway. I would like the youth assembled here to take a lesson from these examples and work to make everything possible. When I think of my childhood days, I am reminded of Shri Sivasubramania Iyer who taught me when I was studying in 5th class at the age of 10. He was one of the very good teachers in our school. All of us loved to attend his class and hear him. One day he was teaching about bird's flight. He drew a diagram of a bird on the blackboard depicting the wings, tail and the body structure with the head. He explained how the birds create the lift and fly. He also explained to us how they change direction while flying. Nearly for 25 minutes he gave the lecture with various information such as lift, drag, how the birds fly in a formation of 10, 20 or 30. At the end of the class, he wanted to know whether we understood how the birds fly. I said, I did not understand how the birds fly. When I said this, the teacher asked the other students whether they understood or not. Many students said that they also did not understand. He did not get upset by our response since he was a committed teacher. Our teacher said that he would take all of us to the sea shore. That evening the whole class was at the sea shore of Rameswaram. We enjoyed the roaring sea waves knocking at the sandy hills in the pleasant evening. Birds were flying with sweet chirping voice. He showed the sea birds in formations of 10 to 20 numbers. We saw the marvelous formations of birds with a purpose and we were all amazed. He showed us the birds and asked us to see that when the birds fly, what they looked like. We saw the wings flapping. He asked us to look at the tail portion with the combination of flapping wings and twisting tail. We noticed closely and found that the birds in that condition flew in the direction they desired. Then he asked us a question, where the engine is and how it is powered. Bird is powered by its own life and the motivation of what it wants. All these things were explained to us within Fifteen minutes. We all understood the whole bird dynamics from this practical example. How nice it was? Our teacher was a great teacher; he could give us a theoretical lesson coupled with a live practical example available in nature. This is real teaching. I am sure many of the teachers in schools and colleges will follow this example. For me, it was not merely an understanding of how a bird flies. The bird's flight entered into me and created a special feeling. From that evening, I thought that my future study has to be with reference to flight and flight systems. I am saying this because my teacher's teaching and the event that I witnessed decided my future career. Then one evening after the classes, I asked the teacher, "Sir, please tell me, how to progress further in learning all about flight." He patiently explained to me that I should complete 8th class, and then go to high school, and then I should go to engineering college that may lead to education on flight. If I complete all my education with excellence, I might do something connected with flight sciences. This advice and the bird flying exercise given by my teacher, really gave me a goal and a mission for my life. When I went to college, I took Physics. 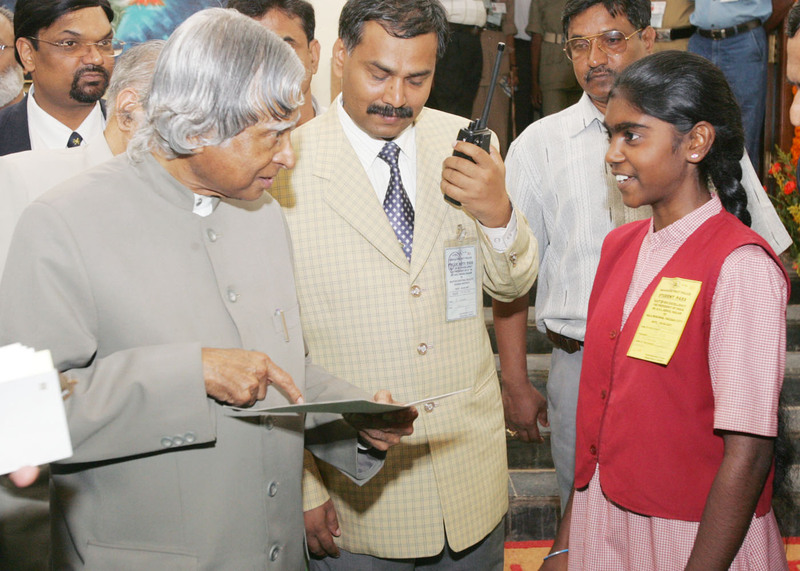 When I went to engineering in Madras Institute of Technology, I took Aeronautical Engineering. Thus my life was transformed as a rocket engineer, aerospace engineer and technologist. That one incident of my teacher teaching the lesson, showing the visual live example proved to be a turning point in my life which eventually shaped my profession. My teacher, Iyadurai Solomon, was an ideal guide for an eager young mind that was yet uncertain of the possibilities and alternatives that lay before it. He made his students feel very comfortable in class with his warm and open minded attitude. He used to say that a good student could learn more from a bad teacher than a poor student from even a skilled teacher. 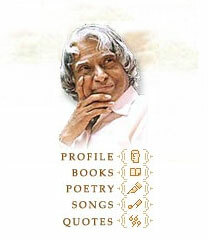 During my stay at Ramanathapuram, my relationship with him grew beyond that of teacher and pupil. In his company, I learnt that one could exercise enormous influence over the events of one?s own life. Iyadurai Solomon used to say, ?To succeed in life and achieve results, you must understand and master three mighty forces- desire, belief and expectation.? Iyadurai Solomon, who later became a Reverend, taught me that before anything I wanted could happen, I had to desire it intensely and be absolutely certain it would happen. I have seen him giving coaching free to many students who were not doing well in the class. They used to make up and subsequently perform better. This message, I am sure is applicable to all the students and youth of today. If all of you desire to live in a developed India you will definitely achieve. 7. I realize, whatever work I do if I do the best, I am contributing towards realizing the vision of developed India 2020. 1. How many steps are there in launching a Satellite? Ans: Let me explain to you with an example of our Polar Satellite Launch Vehicle (PSLV) launching a satellite from our Indian Space port SHAR. As you would be aware PSLV configured with four stages, each of the four stages are separately prepared and are brought one by one to the launch pad. They are stacked one over the other and satellite also assembled on the vehicle. At every phase of assembly checks are carried out. Finally the countdown starts about 40 hours before the planned launch time. During this countdown operations like final preparation of pyros, fuel filling, switching on and testing the electronic systems are carried out. Finally 10 minutes before launch (T) the operations are controlled by computer more than 300 parameters are checked and if any parameter is out of limit the launch can be stopped till the last moment. From lift off to orbiting the satellite typically it takes about 20 minutes. 2. Are there any beings similar to humans living on stars or planets other than earth? Ans: The Search is on. We may find one day. 3. What are escalators? How do they work? "Escalators are one of the largest, most expensive machines people use on a regular basis, but they're also one of the simplest. At its most basic level, an escalator is just a simple variation on the conveyer belt. A pair of rotating chain loops pull a series of stairs in a constant cycle, moving a lot of people a short distance at a good speed." It also has an article, which allows you to " look inside an escalator to find out exactly how these elements fit together. While it is exceedingly simple, the system that keeps all the steps moving in perfect synchrony is really quite brilliant." If you meant space elevators, a space elevator made of a carbon nanotubes composite ribbon anchored to an offshore sea platform would stretch to a small counterweight approximately 62,000 miles (100,000 km) into space. Mechanical lifters attached to the ribbon would then climb the ribbon, carrying cargo and humans into space, at a price of only about $100 to $400 per pound ($220 to $880 per kg). 4. Sometimes the space shuttle and satellite which are sent to space will be failure. Why? Can?t they make them correct? Ans: Failure is a part of any system, however, they are working towards self healing systems. 5. How atomic energy is used for world peace? Ans: Power generation from nuclear energy, medical applications and enhancing the life and quality of seeds through irradiation. 6. What steps can be taken to avoid global warming with respect to industrial revolution? Ans: We have to work towards energy independence. Our aim is to progressively reduce the use of fossil fuels for transportation and substituted by bio-fuels. For electricity generation we have to work towards, solar energy, wind energy and nuclear energy apart from the conventional hydro electric energy. 7. 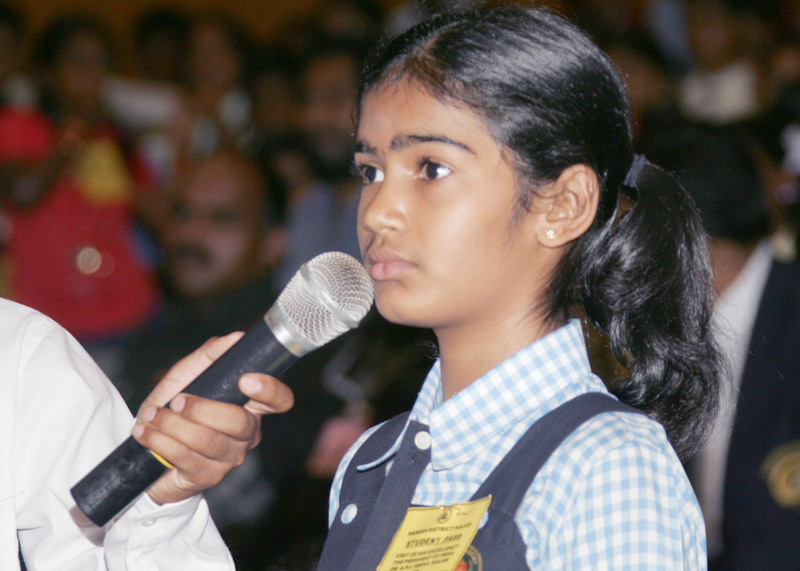 What is your intention of interacting with school children? 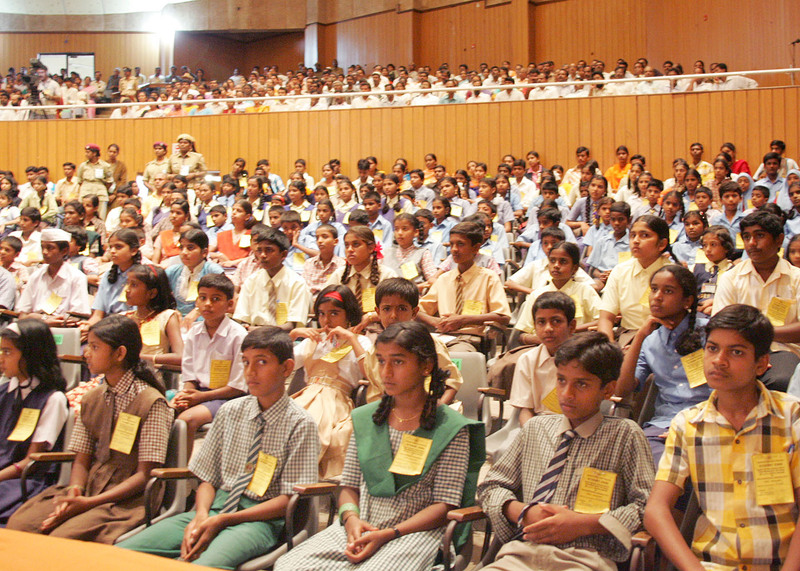 Ans: They are the future of the nation, purest in thinking for discussions and are a fountain of new ideas. When I am with all of you, like any one else, I forget my worries and become elated. 8. 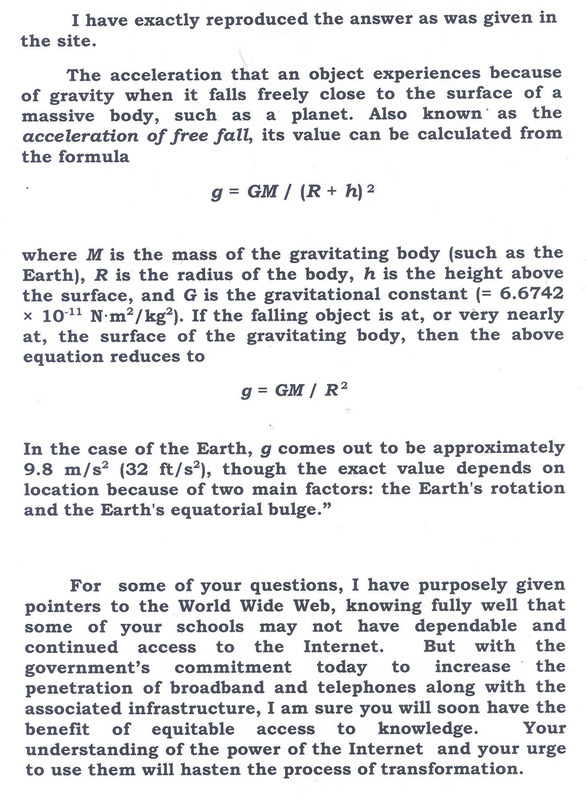 The acceleration due to gravity of earth values on the surface of the Earth. What happens to the acceleration due to gravity. If we move and change the position vertically above the surface of the Earth?